ইংৰাজী (de facto) English is established by de facto usage. ↑ Marden 2003, পৃষ্ঠা 460. ↑ Brewer 2006, পৃষ্ঠা 340. ↑ Office for National Statistics. 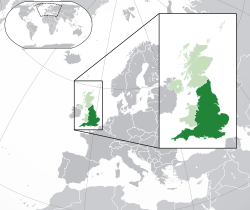 "The Countries of the UK". statistics.gov.uk. Archived from the original on 20 December 2008. http://web.archive.org/web/20081220225201/http://www.statistics.gov.uk/geography/uk_countries.asp। আহৰণ কৰা হৈছে: 1 February 2009. ↑ "Countries within a country". number-10.gov.uk. Archived from the original on 9 February 2008. http://web.archive.org/web/20080209003312/http://www.number-10.gov.uk/output/Page823.asp। আহৰণ কৰা হৈছে: 1 February 2009. ↑ "Changes in the list of subdivision names and code elements (Page 11)" (PDF). International Organization for Standardization. http://www.iso.org/iso/newsletter_i-9.pdf। আহৰণ কৰা হৈছে: 1 February 2009.